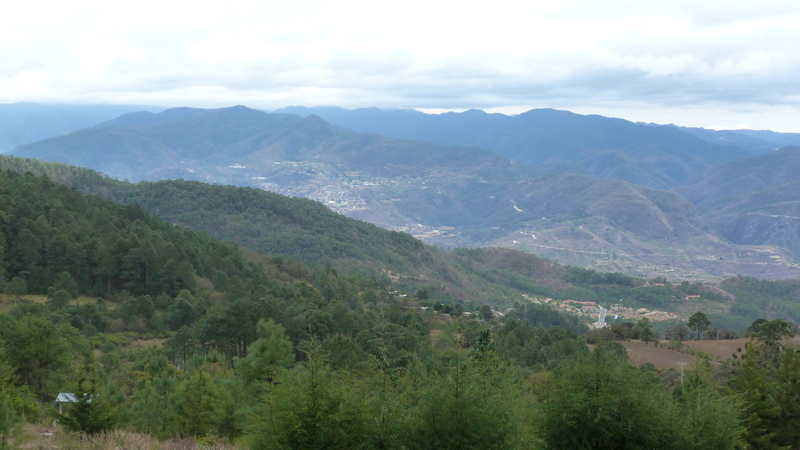 Just north of the city of Oaxaca is the Sierra Juárez mountain range. It is the land of the Sierra Zapotecs, one of the first indigenous peoples of Mexico, whose ancestry stretches back to at least 1000 BC. The mountain range is known for its incredibly rich natural diversity, with over 2000 different plant species, tropical evergreen forests, and a cloud forest that forms a band 1,000 – 2250 meters high. 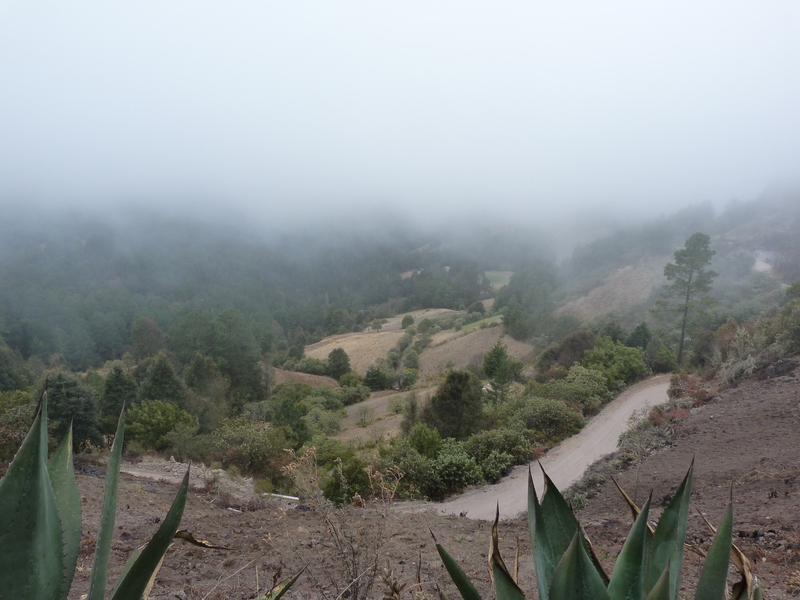 In Zapotec, Schiaa Ruavia means the “hill where the cloud is born”. We rented a car and asked our friend Lynda Wilde, a fabulous photographer from Kingston, Ontario, if she would drive us into the cloud mountains. Heading out of Oaxaca on a cool morning, she also drove us backwards in time. 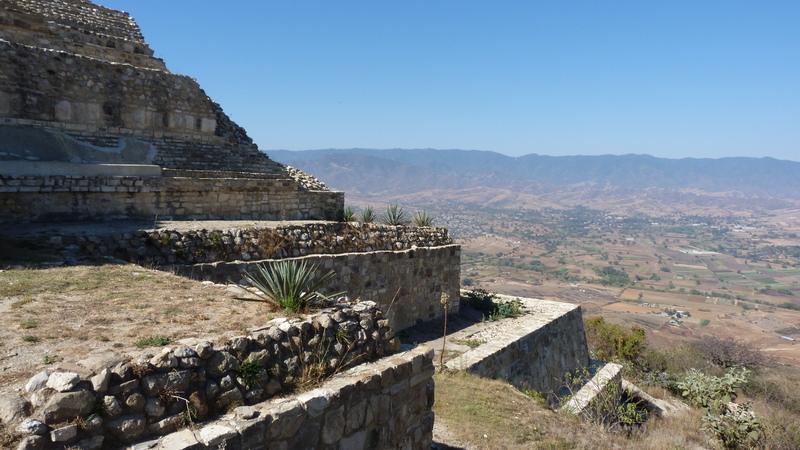 Teotitlán, 37 kilometers outside of Oaxaca, is the gateway to the mountain road. 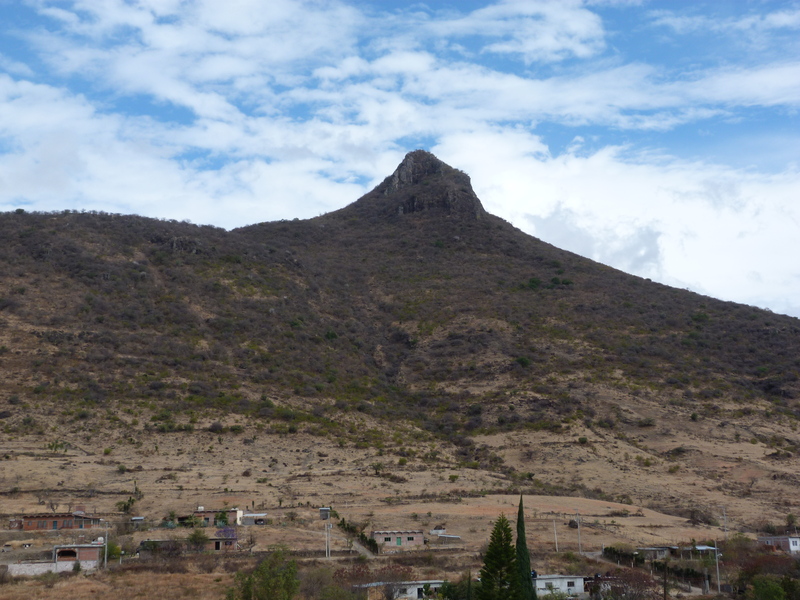 The town sits under the shadow of el Picacho, the mountain where, legend has it, the Zapotecs were born. 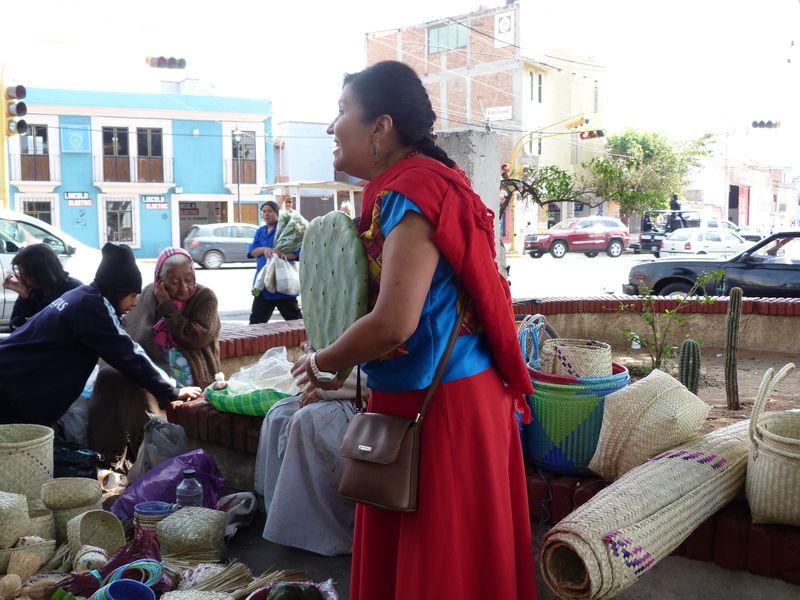 The town has been Zapotec for 2500 years and Zapotec is still the primary language. Teotitlán is famous for weaving. Rugs and tapestries are made on hand looms, mostly with locally sourced wool and dyed with natural, traditional dyes. Even though tourists flock there for the authentic craft, it is small and retains ancient customs and ways. Out of Teotitlán, the road begins a serious sequence of switchbacks. Checking directions in a guide book, we notice for the first time the cautionary sentence, “for fearless drivers”. Linda has done this journey before in her four-wheel drive. Our little economy rental seems wildly inappropriate. It would be a suicidal drive in the rainy season. 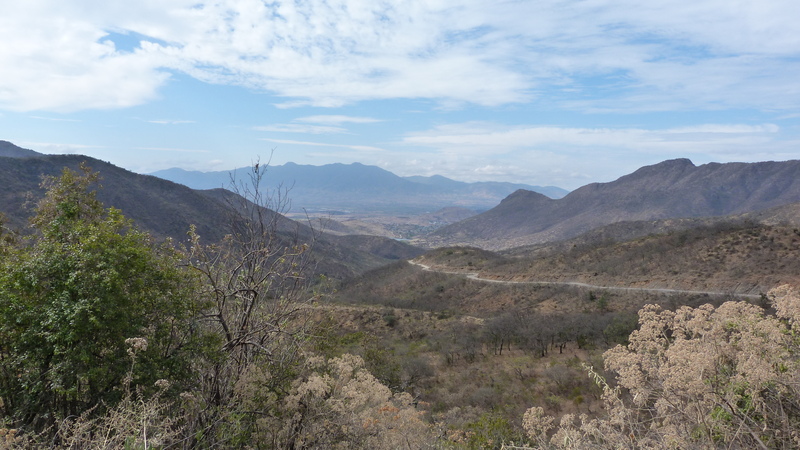 But after travelling through seemingly endless, narrow, remote roads, we arrive at the bustling town of Benito Juárez (population about 1,000), fifty-eight kilometers north of Oaxaca city. The town, originally called San Pablo Guelatao, was the birthplace of Benito Juárez, Mexico’s first indigenous president and Mexico’s most beloved native son. We are now 2900 metres (7200 feet) above sea level, sitting amongst the clouds. It’s cold, so we stop for hot chocolate and pan dolce beside the tourist information centre. The mountains are home to endangered species of jaguar, ocelot and deer. One of the largest areas for butterflies and birds, there is a strong ecotourism movement to try to conserve the forest and protect it from the stresses of logging, agriculture and potential hydroelectric dams. Los Pueblos Mancomunados is a group of eight small towns that have developed trails for hiking, mountain biking and camping in the mountains. 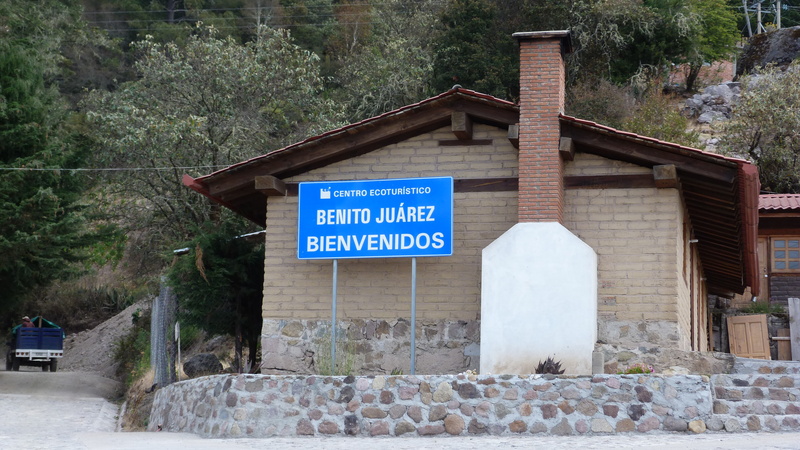 The town of Benito Juárez is one of the starting points. We meet a Polish couple, who ask if we can tell them where the trail begins. We encourage them to go to the information centre, but they speak no Spanish. Intrepid, they head out into the woods. We hope they have a map. In the centre of town we come across school children performing what looks exactly like “Speech & Drama”. 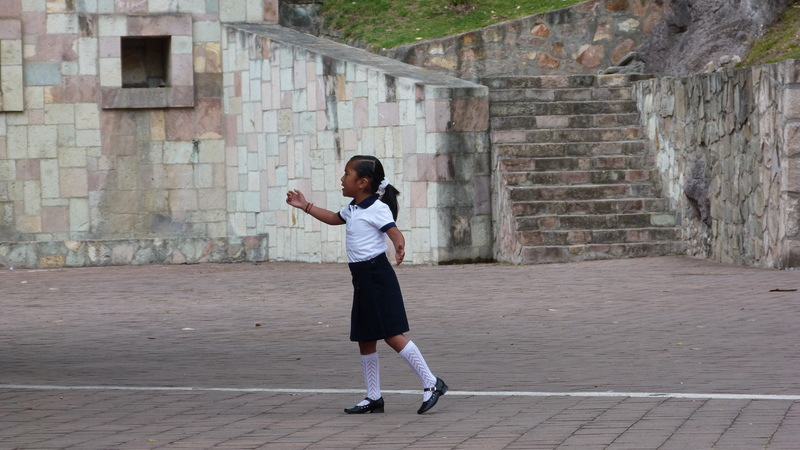 A small girl declaims in the central square, her voice commanding the space as examiners make notes and parents look on. Beside the square is a recreation of Benito Juárez’s birth home with adobe walls, tile roof and dirt floor. Juárez was born in 1806 in the town of San Pablo Guelatao. His parents died when he was 3. He was raised by an uncle and became a shepherd. When he was 12, speaking only Zapotec, he walked to the city of Oaxaca where he was taken in by his sister. Here, his “thirst for learning” was recognized, and he received schooling at the city’s seminary. 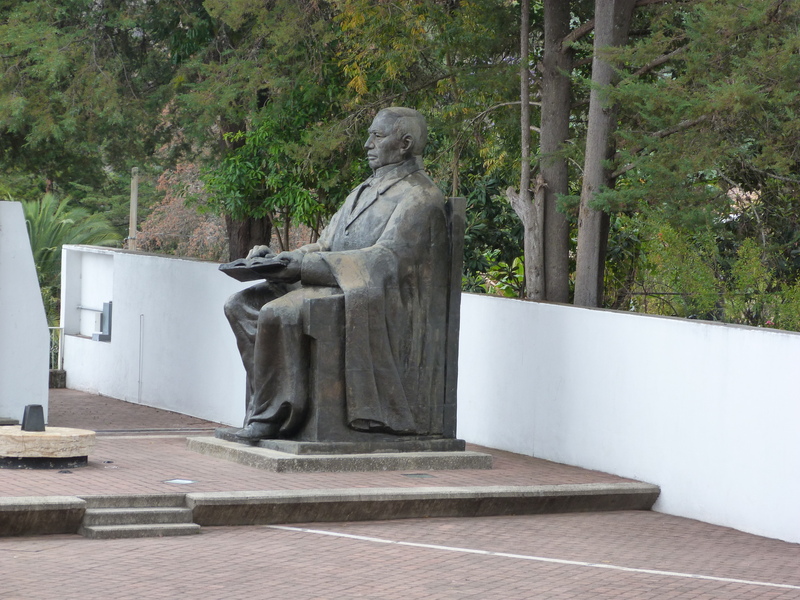 He became a lawyer, entered politics, and in 1857 became Mexico’s first indigenous president. Throughout the country there are statues and monuments in his honour. March 21st, his birthday, is a national day of celebration. The town of San Pablo Guelatao changed its name in his honour. Clearly this is a town of impressive orators. 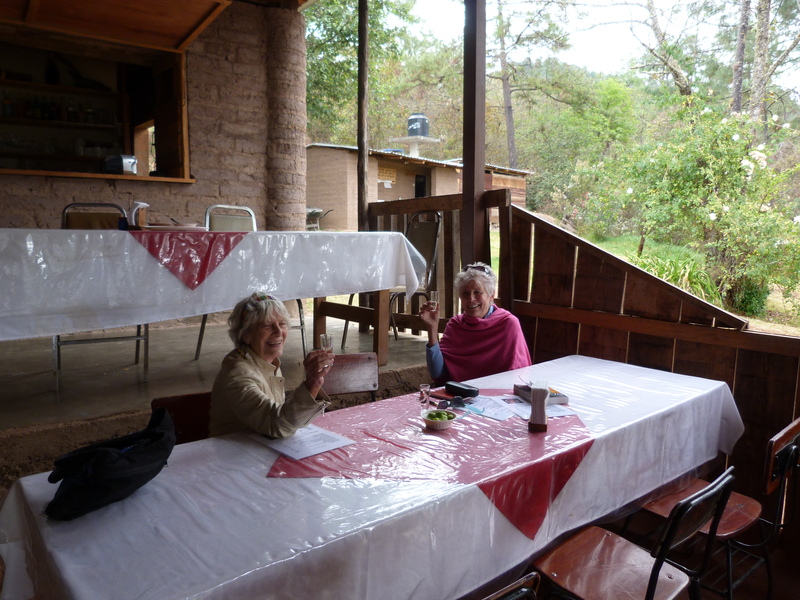 Lynda takes us out of the town on a search for “Truchas Cuachirindoo Ixtlan”, a trout farm in the mountains. A trout farm in the mountains? 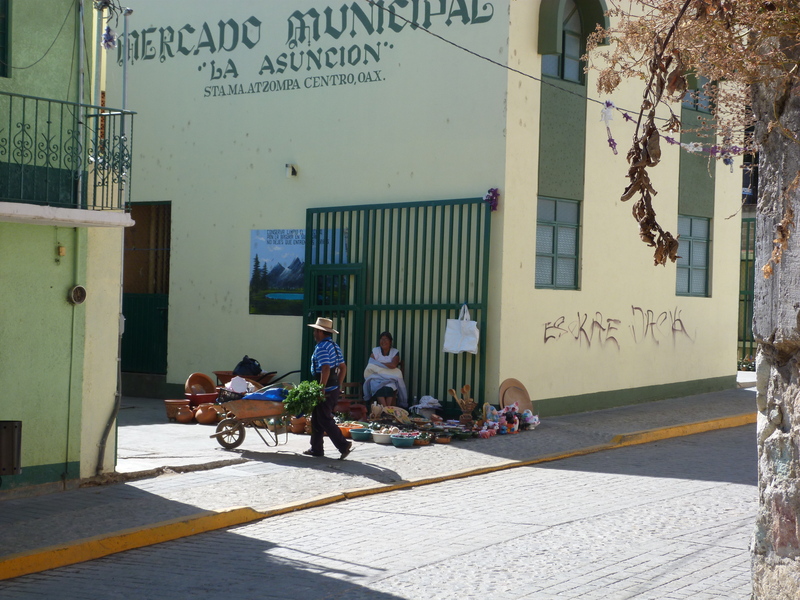 We weave through the tiny streets of Ixtlan de Juárez, searching for handwritten signs that say “Truchas”. It’s like a scavenger hunt. After many false turns, and several dead ends, we find a dirt path that leads to a small parking lot. We’ve arrived. We shiver as we settle at outside tables. But we are greeted immediately by Noel, the owner, carrying glasses of mezcal. Noel grew up Zapotec and left to live in Los Angles before returning home to begin a family business. His English is flawless, so we are able to understand the story of the trout farm. There is a stream running down the mountain, which Noel’s family has tapped into. They have set up a series of holding tanks and, working with water from the stream, have built up their fish nursery. The baby trout are furthest up the mountain. Our lunch trout are in a tank right outside the kitchen door. Noel brings us cups of sweet Mexican coffee to augment our mezcal, and hot toastados to nibble on while he cooks our fish. My filet arrives sealed in aluminum foil. It’s been steamed over the wood stove. I open the foil and the warm smells of tomato, garlic, lime, epizote, onion, chili verde and quesillo (a thin cheese sauce) waft out. The drive may be for the fearless, but it is certainly one well worth conquering your fears. Nora Andrea Valencia learned the techniques of traditional Oaxacan cooking from her late grandmother, Ofelia. Together they earned a reputation for the delicous breakfasts they prepared every morning at La Casa de Mis Recuerdos, the family’s B &B. 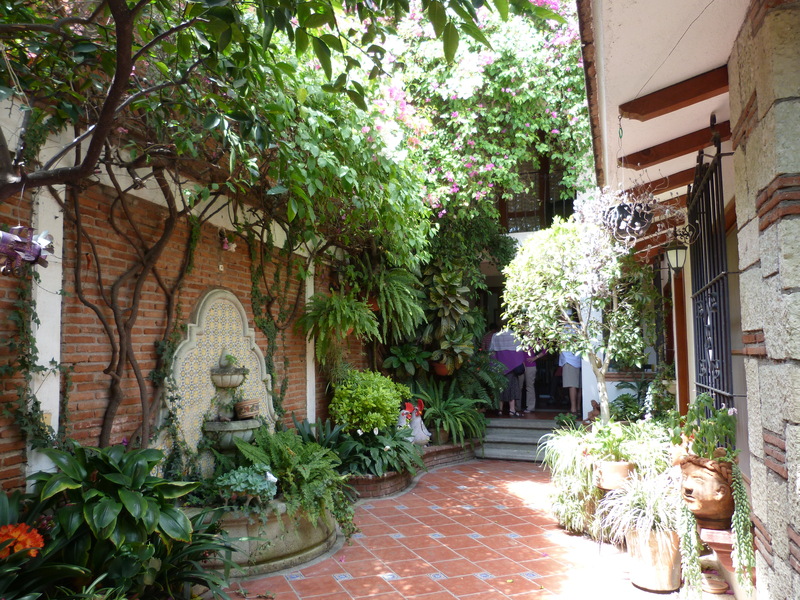 My mother stayed at La Casa de Mis Recuerdos for a number of years, and has become a friend of the family. With interest in Oaxacan cooking at an all time high, Nora has become internationally recognized for her knowledge of Oaxacan cuisine. She conducts cooking classes from her home, (http://almademitierra.net/) and we joined up with a small group for a day of cooking and eating. The history of Mexico can be learned through food. 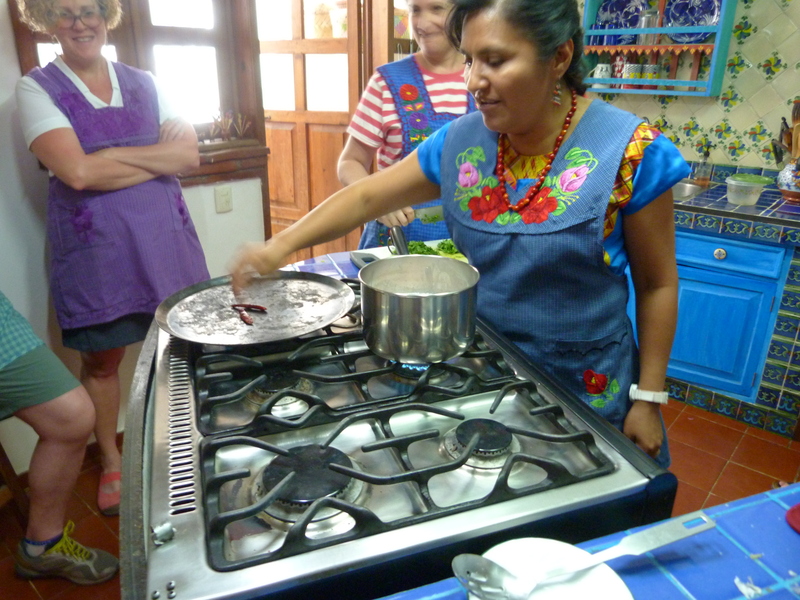 Nora comes from a Zapotec tradition and many of the cooking methods that she has learned are based on knowledge stretching back for thousands of years. But since the Spanish invasion, Mexico has been a blend of cultures. The Spanish brought African slaves with them, and the mixture of indigenous, Spanish and African was perhaps the world’s first true fusion cooking. Our first stop is the Merced Market to buy the ingredients for our comida. 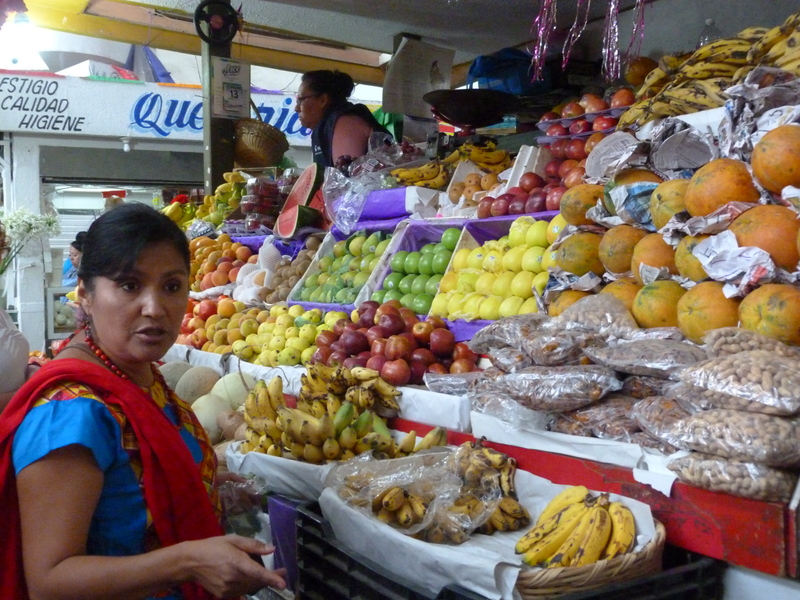 There are many markets in Oaxaca, and this one is in Nora’s home barrio. Before we enter the market proper we meet some of the women sitting outside. Their hands are busy cleaning nopales (cactus pads) of various sizes. 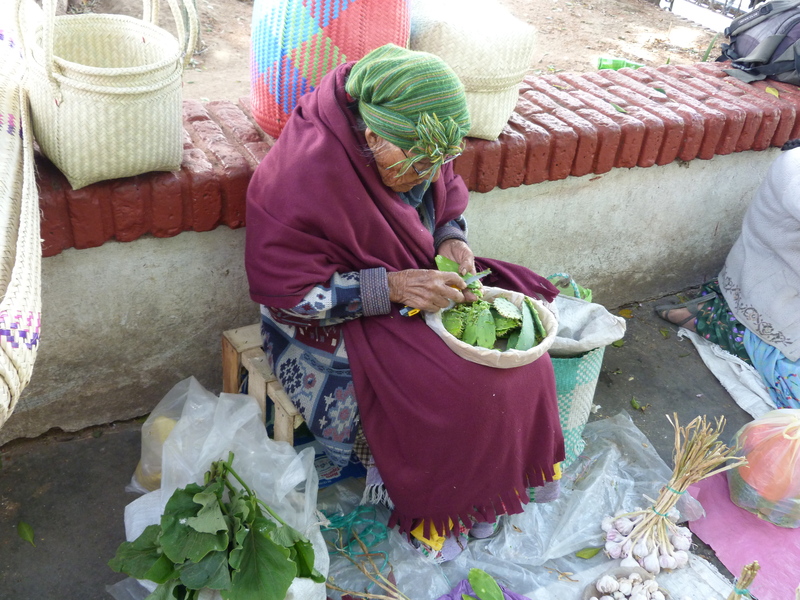 A woman cleaning the spikes from young nopales. Hierba santa is on the ground beside her. Nopales are very good for cholesterol levels, and the Mexicans put them in many different dishes. Nora picks a few choice pads and a big bunch of hierba santa, or sacred leaf. This green is used extensively in southern Mexican cooking. It has a unique lemony, licorice taste and it’s believed to cure just about everything including rheumatism, asthma, bronchitis, digestive disorders and skin conditions. Of course, it is impossible to grow or find in Canada. Nora recommends fennel as a flavor substitute, but there is nothing that can substitute its health benefits. 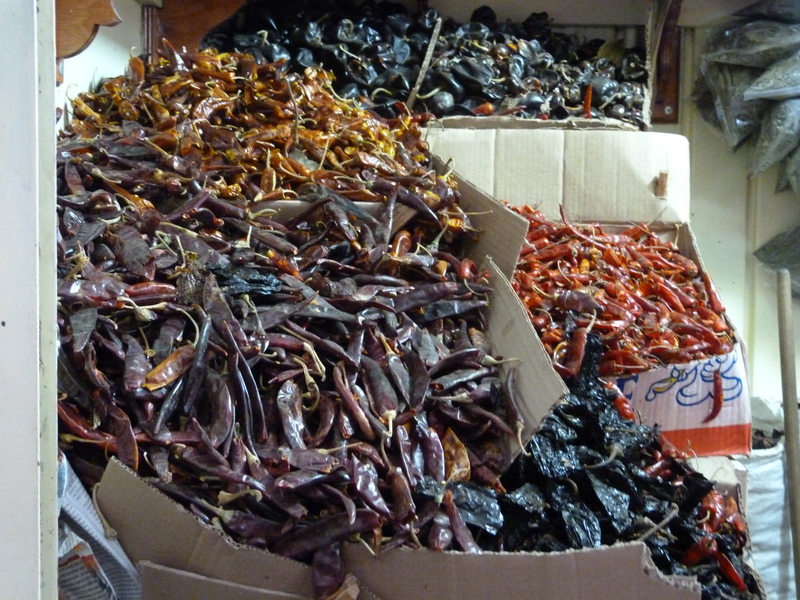 We proceed into the market where Nora explains properties of different chilies, dried and fresh. So many chilies, so many flavours. The capsaicin in chilies is a stimulant and analgesic. It awakens endorphins, which means that “eating chilies gives your body pleasure. It also means you can get addicted to them.” But even Nora admits you can never really know how hot a pepper is. “It’s like a lottery,” she says cheerfully. You just have to keep tasting as you go. If it gets too hot, she tells us to add a bit of something acid, like cider vinegar or tomato, to bring down the spice. She introduces us to the pastillo oaxacaño, a special pepper grown only in the high Mixtec region and smoked in adobe ovens. A ready-made paste from this smokey pepper is a kitchen staple – she keeps it by the stove to add a little zing when necessary. From the chili stand we move to the squashes. Every part of the squash plant is used, and Nora shows us how to pull the fibres from the stems so that they will be softer when added to a soup. 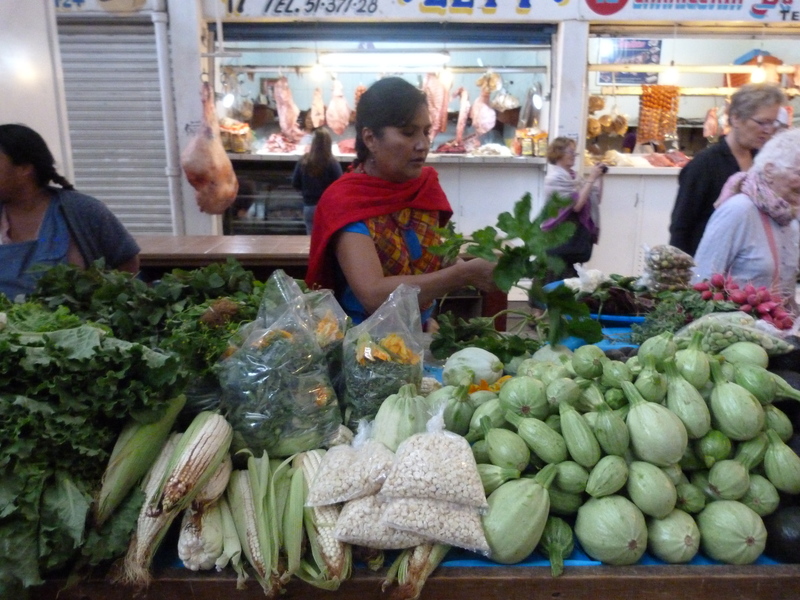 Bags of ingredients are sold cut and ready to cook a perfect Zapotec soup – squash stems, squash blossoms, pieces of squash, pieces of corn. Nora selects some perfect blossoms for our soup. “We only use the male blossoms. They are very showy, but not good for anything else,” she laughs. At the tortilla stand, Nora shows us the soft masa dough that makes Oaxaca’s unique tortillas. Northern Mexico uses wheat for tortillas. In the south, they are corn based. Preparing the dough is an incredibly labour intensive process, involving lime and soaking and grinding corn. The result is a velvety soft corn dough that makes light tortillas totally unlike the hard corn tortillas I buy at home. Next, Nora takes us to the cheese stand. I am addicted to Oaxacan cheese. There are two kinds – soft and stringy. 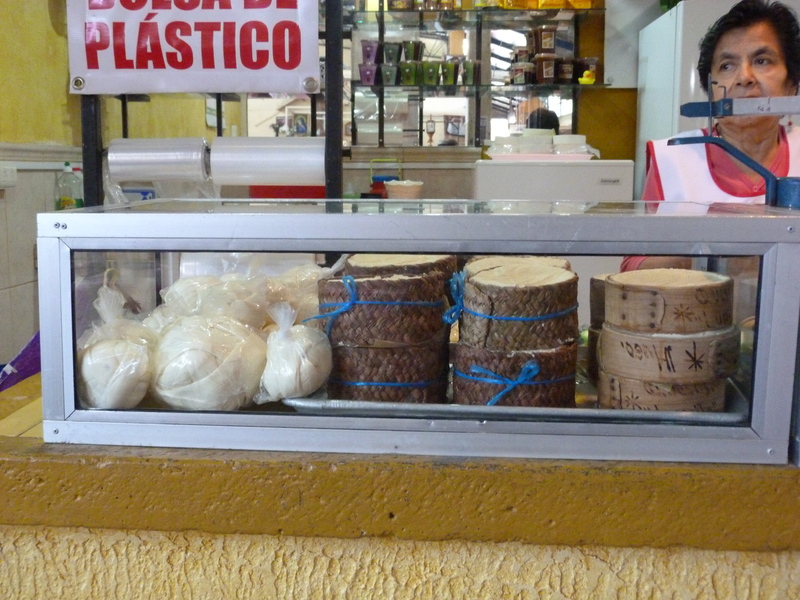 The soft cheese is sold in wooden boxes to keep it moist. Like a cross between a ricotta and feta, it is crumbled over salads, enchiladas, and most dishes that have sauce on them. The harder cheese, Oaxacan string cheese, is boiled, kneaded and stretched into strands. It is melted in quesadillas, separated into strings for raw eating, wound into tight small balls to include in soup. It is salty and chewy and tastes like nothing else I’ve ever had. Mangos come in different sizes, colours and varieties. The small ones are super sweet and perfect for just eating a bit of fresh mango. The larger ones are better for adding to other ingredients – they absorb other flavours well. We head to Nora’s home to turn these fresh ingredients into our comida. Mole. Originally from a Zapotec word, mole (pronounced Moh-LAY) reflects a whole concept in cooking – blending ingredients together to make a paste for a cooking sauce. Guide books talk about the 7 moles of Oaxaca. “But it’s impossible to have just seven,” laughs Nora. Mole is a concept, more than a specific thing. It is ubiquitous. “Aguaca” is Zapotec for avocado. Thus we get guaca-mole or guacamole – ground up avocado. Nora gets us chopping and peeling. Our Comida today consists of “Consome de Hierba Santa”, a light chicken soup with tons of garlic and hierba santa, served over squash blossoms and balls of Oaxacan cheese; “Ceviche de Mango”, a marinated red snapper salad served on tostados; “Pipian de Camarones”, a pumpkin seed mole with shrimp and nopales; “Salsa Borracha”, literally drunken salsa – a hot sauce made from our dried peppers; and “Gelatina de Kahlua”, a light dessert jelly of coffee and chocolate. We are assigned tasks. We do a lot of dry toasting on a comal, a flat dry pan traditionally made of pottery. We dry toast chili de arbol, chili de onza, and chili mora for our salsa borracha. We dry toast and boil huajillo chilies for our mole. We dry toast and grind pumpkin seeds, the thickening agent for the mole. We peel our fresh shrimp and make a shrimp stock with the shells. 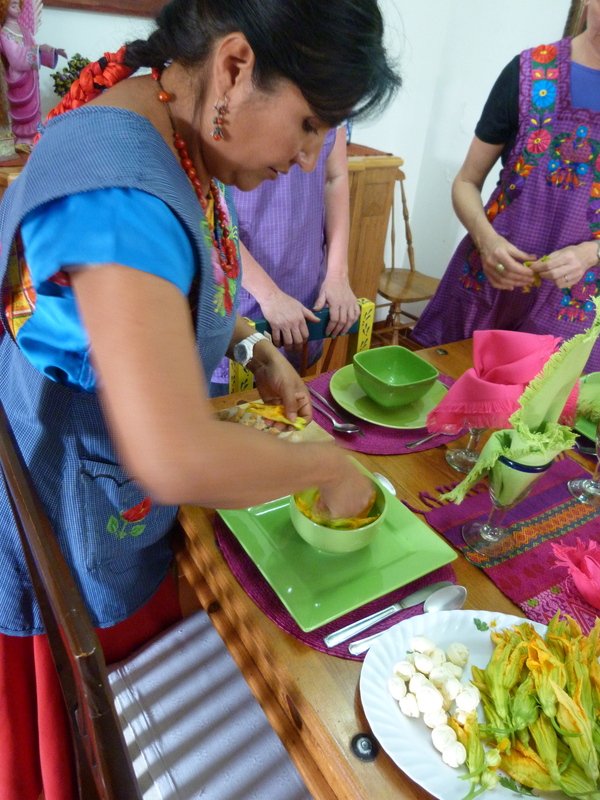 We cut and cook nopales; chop onions, mangos, cilantro and avocado for the ceviche. We lightly cook chunks of red snapper. Everything in Nora’s kitchen happens at a measured and even pace as she laughs her infectious laugh and sprinkles our cooking with historic and gastronomic information. We sip, dip orange slices in the chilies, taste and sip again. We are ready to eat our comida. It is as wonderful as you can imagine. Our class is over, comida is finished. We’ve had a good day with Nora Valencia! Oaxaca is known for its cuisine. Apparently there was an article in the New Yorker recently that raved about a particular Oaxacan restaurant. For those gringos/gringas who have been coming to Oaxaca for many years, the article presented a terrible conflict. It is wonderful for the world to know about the wonders of Oaxaca, but for those who love it, Oaxaca is treated as a well-guarded secret, a secret that could be jeopardized by more tourists. I struggle with the word “tourists”. The Canadians and Americans that I’ve met come here for 2 – 3 months every year. 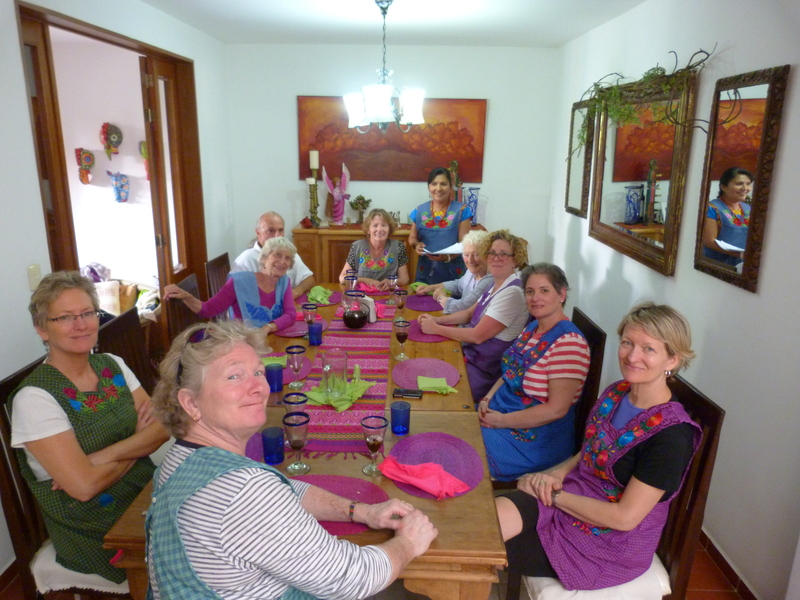 They study Spanish, they take cooking classes, they contribute respectfully to the life of the city. I am only here for two weeks, and my Spanish is abysmal, but I have been welcomed into the homes of the ex-pates and, through my mother, have been given the chance to see a bit deeper into the life of the city. Last night I was initiated into the smoky world of Oaxaca’s best-known specialty – Mezcal. Mezcal is Oaxaca’s equivalent of Scotch, and serious mezcal drinkers treat it with reverence. 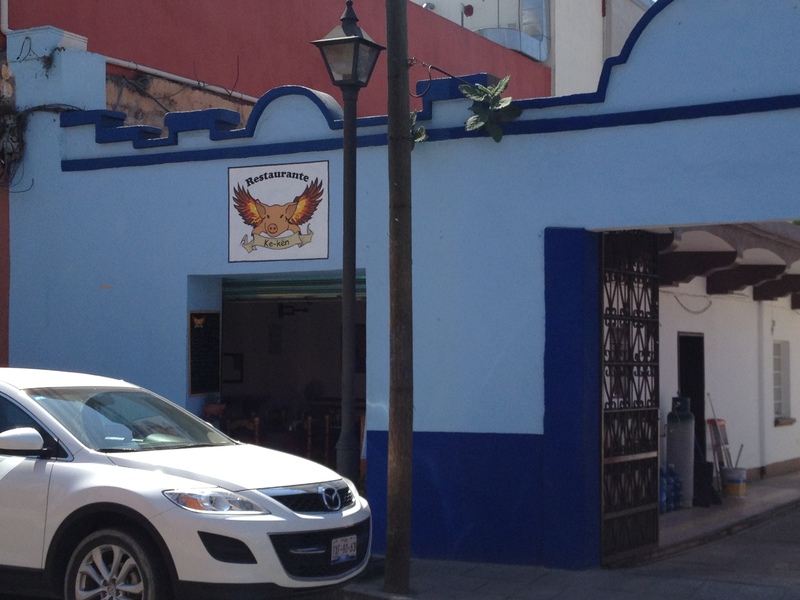 Many come to Oaxaca just to tour the distilleries, of which there are 570 in Oaxaca state. It’s produced using the same methods that have been used for over 200 years. As with Scotch, the best distilleries are prized, and differences are compared, savoured and discussed. 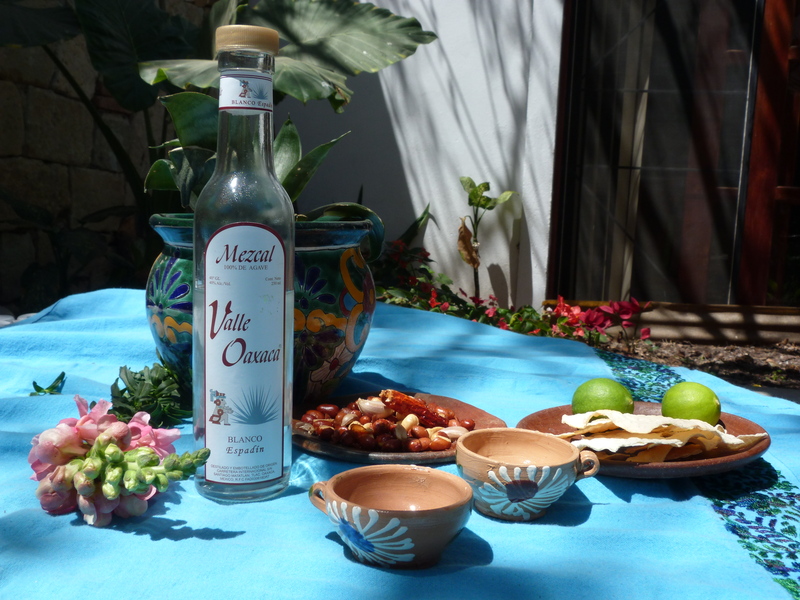 Mezcal is made from the piña or heart of the maguey plant (a kind of agave). Oaxaca state has the perfect climate for growing maguey plants, and they are cultivated throughout the region. The plants are harvested when they are between 7 – 15 years old and weigh about 40 kilos. The central hearts are chopped out, roasted in a pit, mashed to a pulp and distilled in casks made from either barro (baked red clay), copper or aluminum. Traditional mezcal has chicken or turkey breast put into the fermentation, but contemporary mezcal sometimes adds fruit or chocolate. In a rush to attract foreign consumers, mezcal producers are adding caramel syrup and a variety of sweet flavourings. For serious mezcal drinkers, true mezcal may be an acquired taste, but it is one worth acquiring without the trappings of commercialism. Mezcal bottles will often include the larva from a moth that lives on the agave plant (“mezcal con gusano”), and there are many arguments about the correct way to imbibe the worm. The worm is said to add flavour. It definitely adds mystique and price to the marketing. 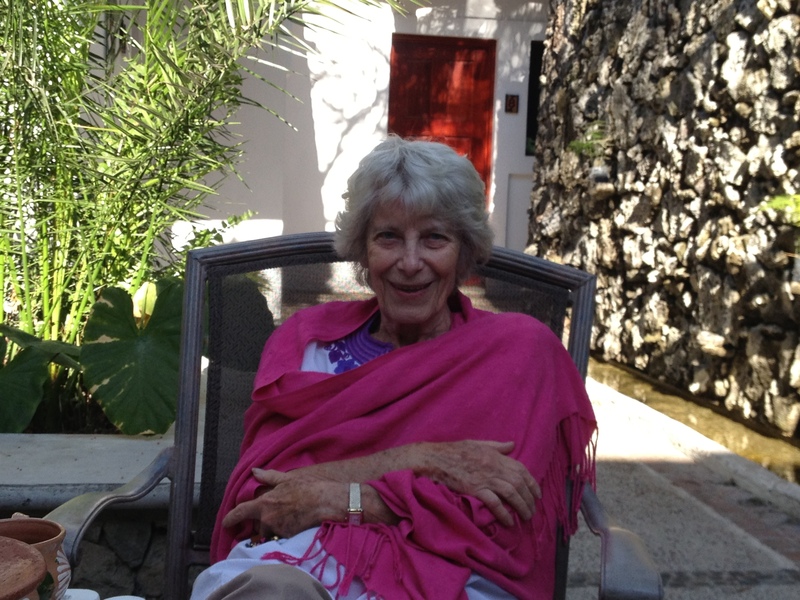 My mother’s friend Virginia is a lawyer from Kingston who lives in Mexico for four months of the year. She has a wonderful and spacious apartment that allows her to escape the Canadian winter, a climate that plagues her lungs. She loves traditional mezcal, and invited us over to a tasting to compare three types. At Virginia’s I met Dwayne, Canadian from Vancouver who lives in Oaxaca for 5 months of the year. Virginia and Dwayne met many years ago in a Spanish class. The formal Spanish class has long since evaporated but they have continued to meet, swap Oaxacan confidences, and argue over mezcal. Our tasting begins with Albarradas, the “house brand” of a local restaurant. Virginia pours the clear liquid into tiny red clay cups. “You have to take the first sip into your mouth and hold it there as long as you can. You let it burn until you think ‘Why am I doing this?’ Then you swallow.” This, Virginia explains, will open up our taste buds. I taste salt on my lips before I am aware of the smokey essence that fills my cranium. I hold and swish until it begins to hit my tear ducts, at which point I swallow. I make the mistake of breathing in through my mouth, and am enveloped in a haze of alcoholic fumes. Mezcal is between 45 – 55% proof. But I like the smoke. The mezcale stays in my mouth, on the tongue, for a short time. It is clean and a bit citrusy. “But it sure helped me to enjoy the Wagner,” she said. The Chichicapa is much smokier, deeper, earthier than the Albarradas. There is less salt, little citrus. Complex and satisfying, it lingers longer on the tongue. Dwayne says that is due to the “pechuga de pollo,” the chicken breast. Virginia, a vegetarian, disagrees but acknowledges that it tastes too good to care one way or another. We finish our tasting with a tobalá mezcal from the Unión de Palenqueros de Oaxaca. (Tobalá is a smaller maguey plant. 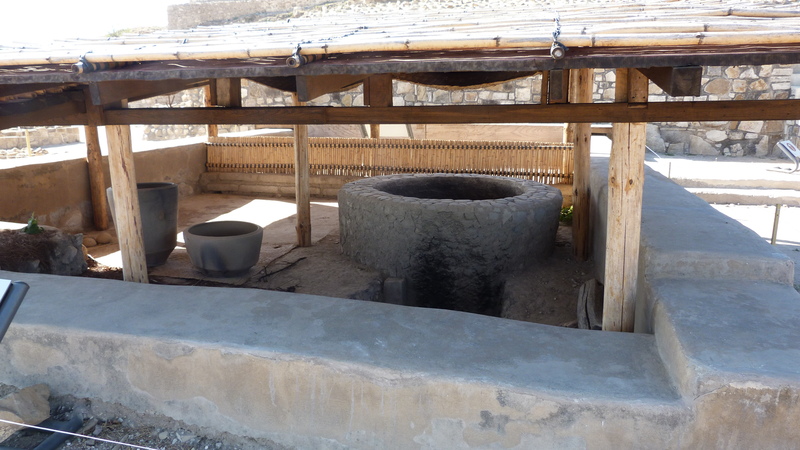 A palenquero is a mezcal maker.) It is as different from the Chichicapa as an 18-year single malt is to a blend. Adequate, with just a hint of sweetness, more complex than the Albarradas, it served mostly to show the brilliance of the Chichicapa. Two million litres of mezcal are produced annually in Mexico. It’s believed to cure hypertension and diabetes, and that it is an aphrodisiac. “Para todo mal, mezcal, y para todo bien también” – for everything bad, mezcal, and for everything good, as well. 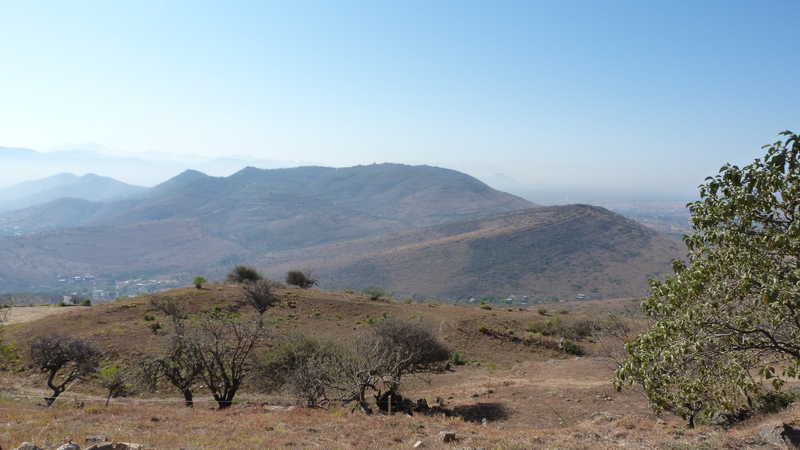 For more than a millennium, successive generations of Olmec, Zapotec and Mixtec peoples ruled the life of the Oaxacan valley from the city state of Monte Albán. Carved into a mountaintop 6400 feet above sea level, vast areas were levelled in 300 BC for terraces and plazas. Temples and residences that allowed for seismic movement were built using layers of quarried stone and adobe. 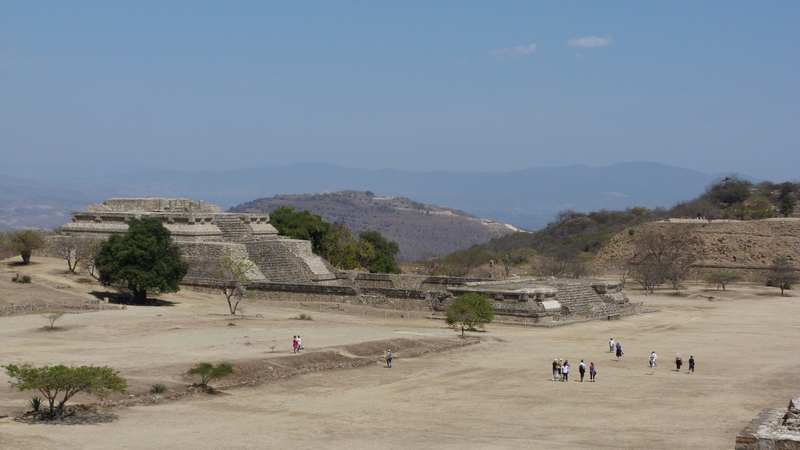 By 800 AD, 50,000 people lived in the city of Monte Albán. It was so large that suburban satellite neighbourhoods were built on surrounding mountaintops. 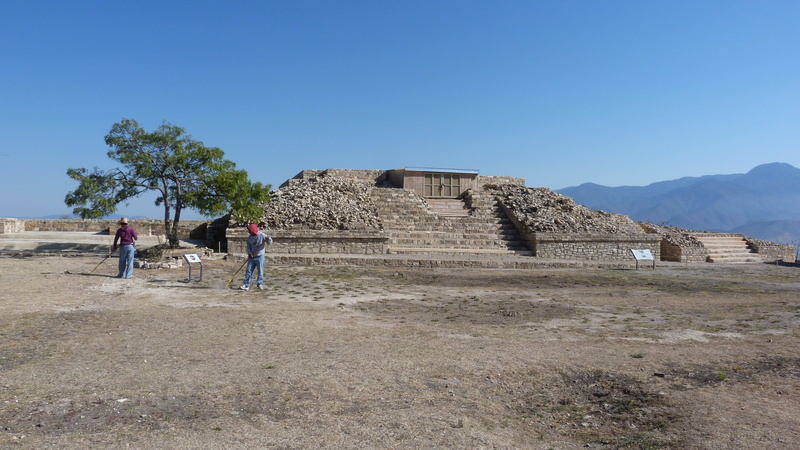 Monte Albán was declared a World Heritage Site by UNESCO in 1987. 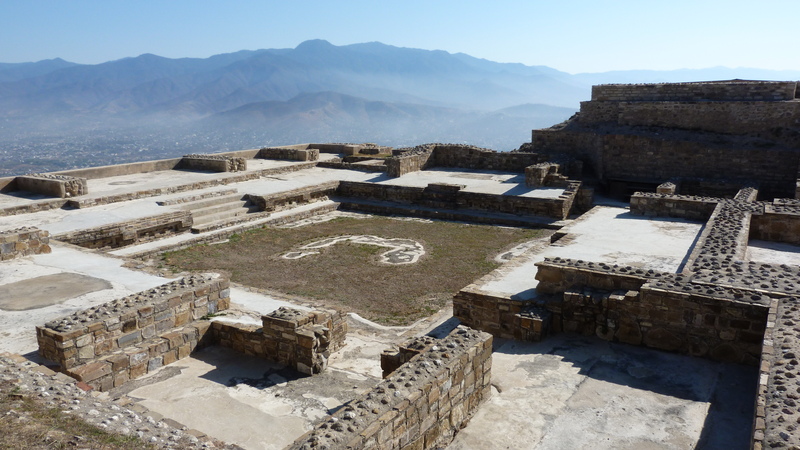 When you are in Monte Albán, you feel as though you at the top of the world. There is nothing between you and the sky. The scale of the city is overwhelming. The central plaza is exactly oriented on the cardinal points (I checked with a compass), and so large that it dwarfs people as they cross. Stone staircases seem built for giants. It was built to impress. 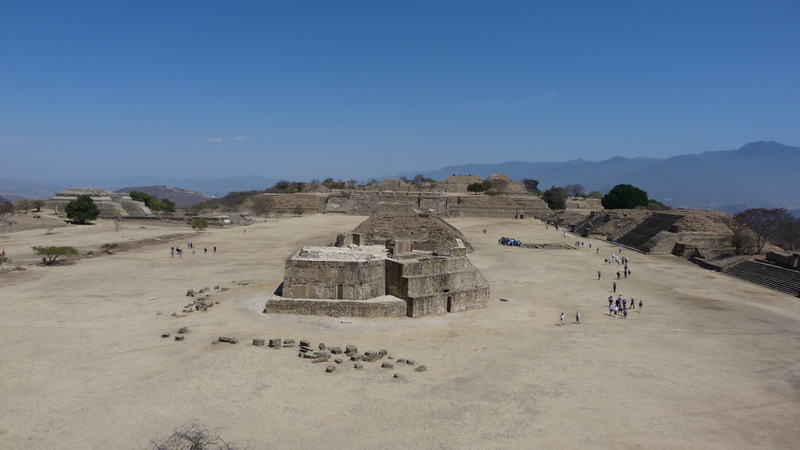 My mother and I have been to Monte Albán before, and wanted to go again, but we wanted to start with a visit to Atzompa, one of Monte Albán’s satellite neighbourhoods. The Atzompa archeological site has only been open to the public since the fall of 2012, and there is little information about visiting. New roads are being built to access it, but as yet there are few who travel there and it remains undiscovered by most tourists. So we hired a car and driver to take us to the top of the world. We left early in the morning to avoid the heat of the day. 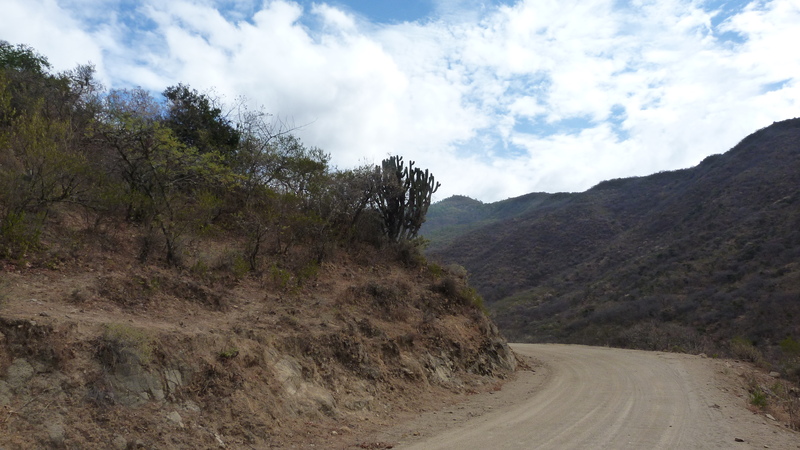 Our driver Vincent took us out of Oaxaca, edging upwards through villages with dusty, winding streets. The “modern” village of Atzompa is known for its distinctive green pottery. About 90% of the villagers are involved in making pottery. It’s a traditional village and there is terrible poverty, but people are scraping by somehow. There’s a small artisan’s market for intrepid tourists, but we passed by, and headed up the mountain. We passed a man with a burro, laden with something that looked like coal or maybe just rocks. We passed workers building the new road. Up and up Vincent drove, weaving past barriers, until he could drive no further. Mom and I set out on a newly created gravel stairs, leaving Vincent to wait in a newly built but vacant parking lot. There is an entrance to the Atzompa archeological site, where we signed in. From the sheet I could see that there were 4 visitors yesterday, 18 the day before. Today, we have the place to ourselves. 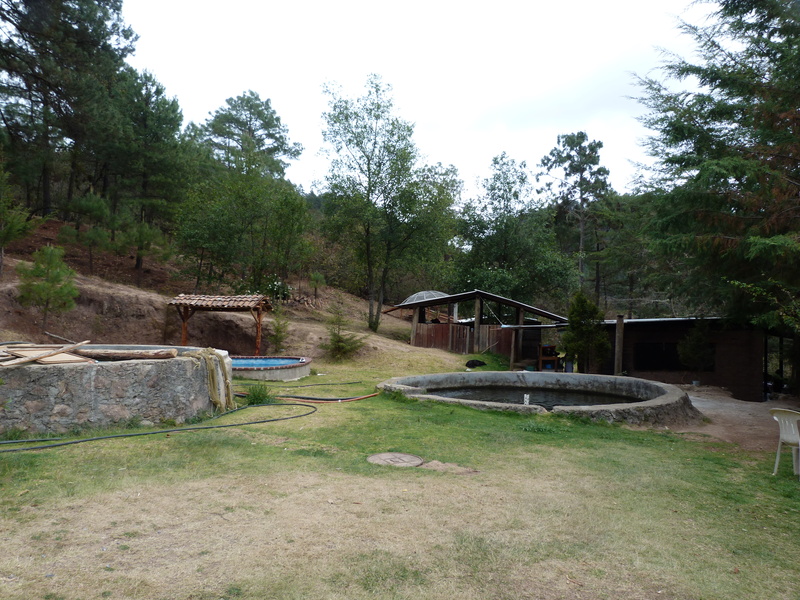 The name Atzompa is Nahuatl meaning “at the headwaters”. It was built by Zapotecs from Monte Albán about 1200 years ago. After about 600 years of Zapotecs, it was inhabited by Mixtecs for over 600 years. 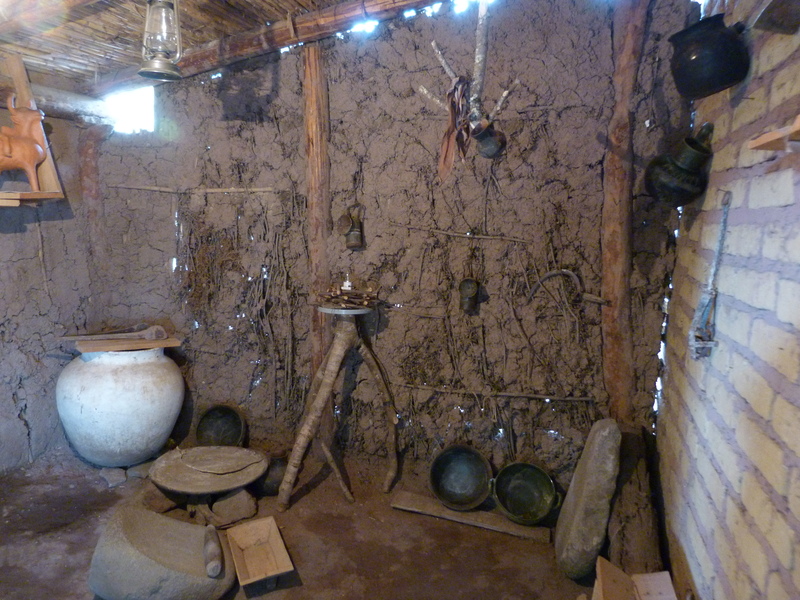 The pottery making inhabitants of the contemporary village of Atzompa are descended from those Mixtecs. 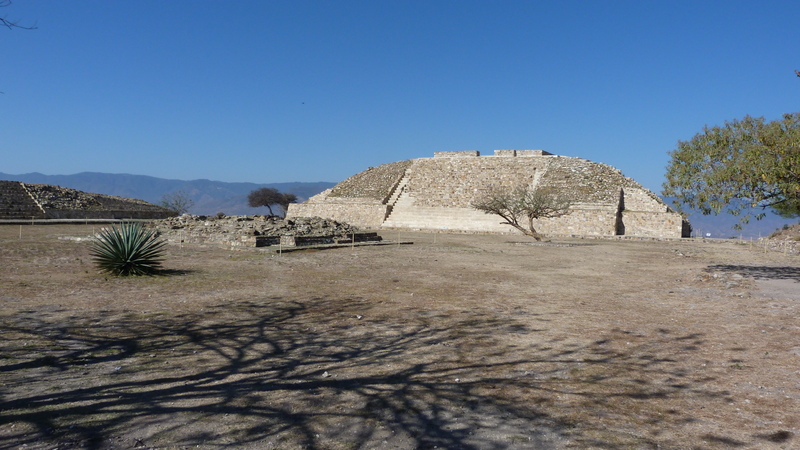 Atzompa was built in a similar style to Monte Albán, although scaled down. There are small plazas, a temple, a tomb with funerary chambers, an artisan’s area, a stone quarry, and a large ball court. 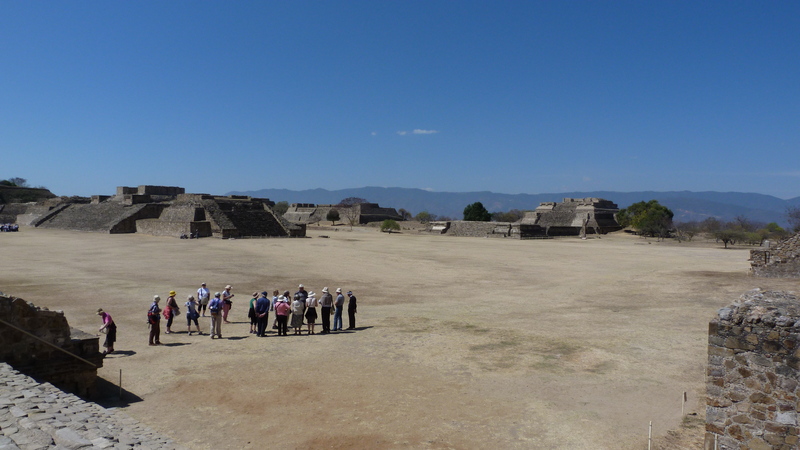 From “Plaza C” you can see across to the city of Monte Albán, as well as to other, as yet uncovered, satellite neighbourhoods. The plaza makes us understand the level of wealth and privilege in Atzompa. Residents looked down on the peasants, workers and farmers in the valley. They looked across to the seat of power, both political and religious. But it was also practical. Looking down, they could easily see movement or threats from other people travelling in and out of the valley. These were wealthy and powerful people, who lived in luxury. The main square is 50 x 50 metres, bordered by a temple, with a central burial mound. One of the two residences, the House of Altars, has a sunken patio surrounded by a sidewalk, and 18 rooms accessed by four different staircases. Servant’s quarters were attached by walkways. A desirable house, in prime location. 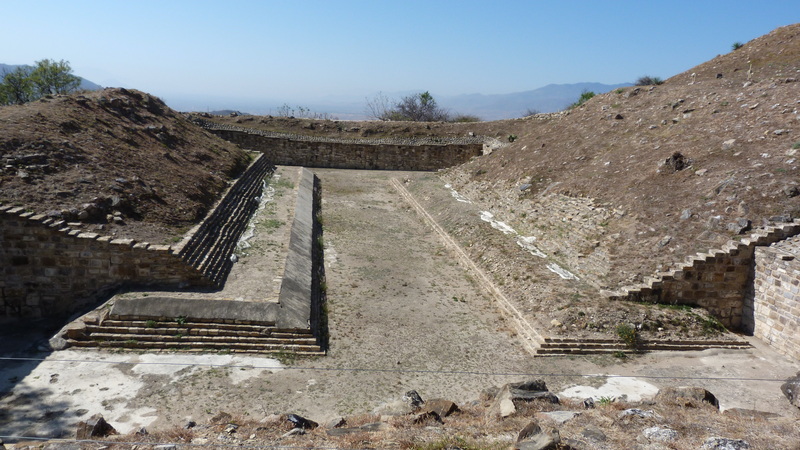 The ball court, one of the largest in Meso America, is 5 x 22 metres in an “I” shape, with a north/south orientation and long benches for spectators on either side. Ball games had both religious and political ramifications, and were “practiced to influence the movement of the stars in the sky, the continuation of the existence of the cosmos, and thereby, the continuation of life” (so the signage at Atzompa tells us). It is easy to imagine, as we stand so close to the sky, the power and influence of the games. There’s a kiln and ceramic studio here. The original building hasn’t been excavated, as it sits 2.5 metres under the surface, but a re-creation gives weight to the importance of the studio, which specialized in large cooking pots. As today, each artisanal home is responsible for one type of pottery whether it be pitchers, griddles, casseroles or toys. I think back to the potters we passed on our way here. Tradition goes a long way back in this part of the world. A burial chamber was unearthed in July, 2012. Not open to the public, it’s been dated to be 1100 years old, apparently in amazing condition, and unique in its design of three layers of tombs above ground and brightly painted murals on the walls. A wooden structure sits incongruously on the top, replacing the original stucco temple. The restoration is clearly still in progress, but the only work we see being done today is by men slowly raking stones on the plaza. My grandmother started going to Mexico in 1970. She continued to journey south every winter until she was 89, when it became too hard to travel. In 2003, my mother and I scattered her ashes in Oaxaca City, Oaxaca, Mexico. My mother has been travelling to Mexico since 1975. Like my grandmother, she loves the land and the people and, of course, the fact that there is no snow or ice. In 2001, Oaxaca became her winter home. Now, I’ve come to visit and escape the deadening greyness of winter in Eastern Ontario. I’ve left Tim at home, writing, and for a few precious weeks I’ll immerse myself in colour, feel warmth on my skin, shed layers of clothes. 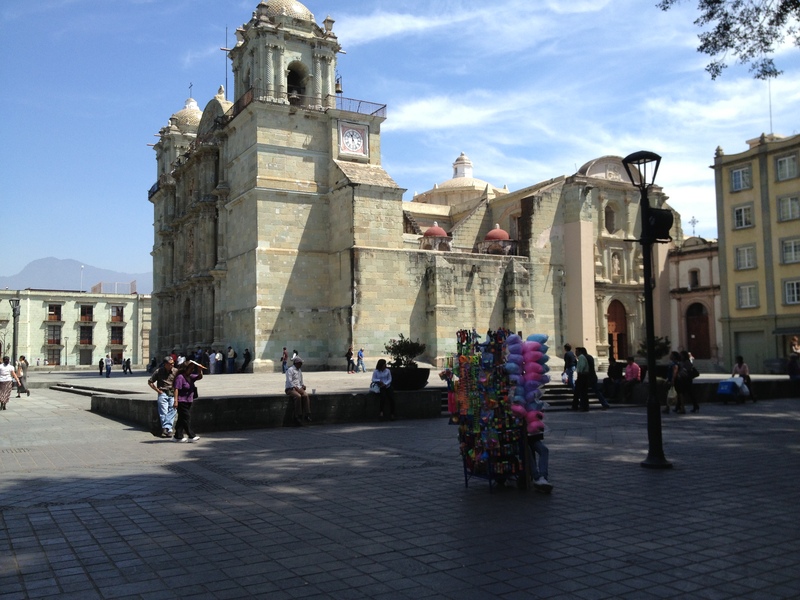 Oaxaca City is in the capital of the state of Oaxaca, a central area of Mexico. The word Oaxaca comes from the Nahuatl (Aztec) word Huaxyácal meaning the “summit of the acacias” and the city sits over 5,000 feet above sea level. The colonial city centre was declared part of the Cultural History for Mankind by UNESCO in 1987. This isn’t the place to go into colonial history, but the confluence of cultures forms the city. Zapotecs, Mixtecs and Aztecs lived in the Oaxaca Valley for at least a 1,000 years before the Spanish arrived. With the conquest, the Spanish built on top of the original Aztec fortress. They designed the city around a central square, the Zócolo, and oriented it to the cardinal points. The cathedral, built over the Aztec spiritual centre, is along one side of the square and facing it on the other side they built the municipal buildings. Thus the square was designed to radiate a balance of civic and spiritual power throughout the city. Today, Oaxaca is a busy and friendly city of 250,000 that does, in fact, seem very balanced between both worlds. On one side of the Zócolo is a permanent tent city of protesters. On the other, there are constant processions in and out of the cathedral. 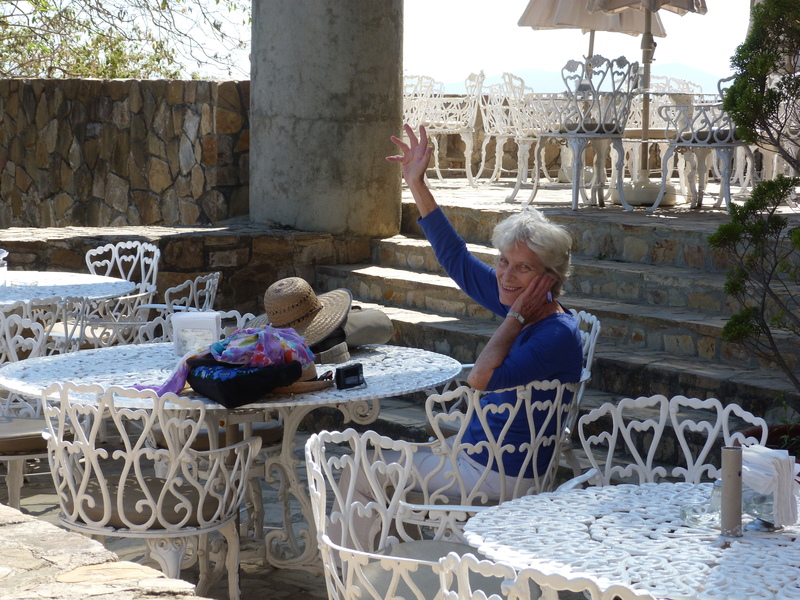 The weather in Oaxaca is blissfully temperate. Mornings are cool, and I must wrap up in a shawl as I sit on the patio for morning coffee. 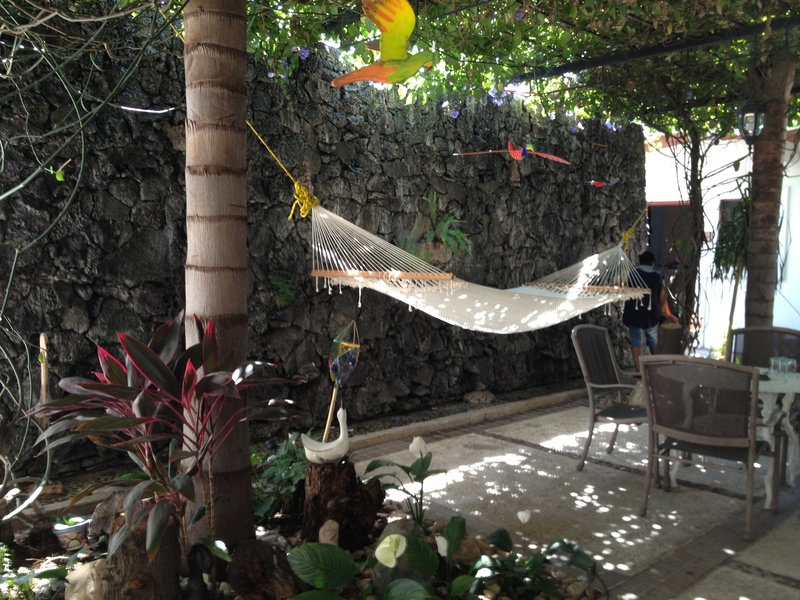 My first morning in Las Mariposas, the family run hotel where we are staying, I am treated to fresh tortillas stuffed with black bean sauce, salsa, zucchini blossoms and cheese, cooked on an open grill on the patio. My mother and I spend the morning walking the city streets, looking in shops, smiling at people. There is, everywhere, a mixture of wealth and extreme poverty. My mother carries coins to distribute as we walk, making a special effort to give money to musicians and elderly women. Yet even with the poverty, there is a feeling of ease on the street, an assurance of safety. My mother constantly reminds me to slow down. Not because I am walking too fast for her, but because I am walking too fast for life. We sit in the Zocolo listening to speeches about workers rights and watching the women and children make their rounds selling shawls, beaded jewelry, gum, wooden toys and bookmarks. Young children are employed in the family business of selling on the streets. Why aren’t they in school, I ask. “School costs money. Uniforms cost money,” explains my mother. “Many children cannot go. And many of those that do, only go half days.” I know this should depress me, but all around me are smiling, encouraging faces. Food, and food preparation, is everywhere. Comida is the main meal of the day, served from about 2:00 – 4:00. 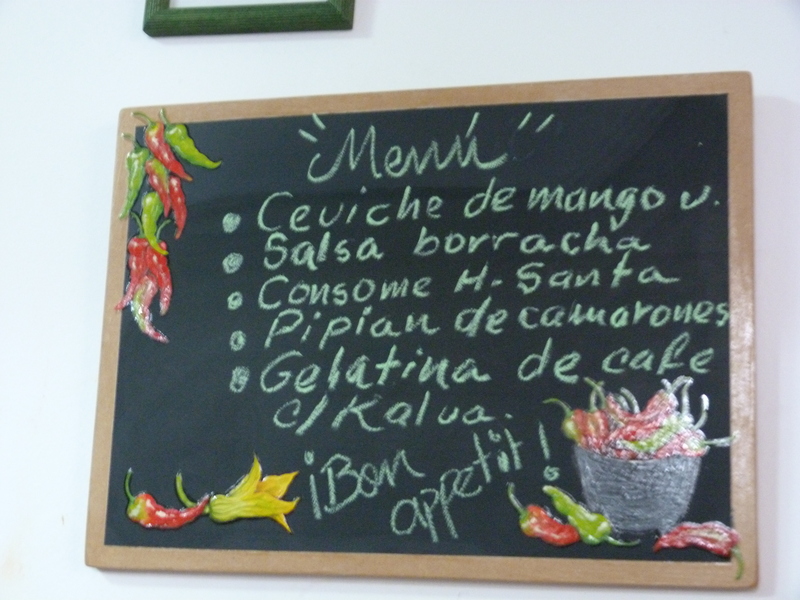 There’s a small restaurant beside our hotel where the owner serves a simple comida, with daily specials. Today’s menu includes Chayote soup, a kind of Mexican squash. When we ask, the owner/cook brings one from the kitchen to show us. It is light green and shaped like a fat pear. The soup is soft, light and topped with a sprinkling of fresh coriander. Second course is a “dry soup”, a rice pilaf accompanied by hot salsa and a kind of guacamole sauce. We pause as we sip our pineapple water. Lighter than juice, it is a way of getting all of your electrolytes and hydration at one go. Chillis Rellanos are stuffed poblano chillis that are battered and fried. Today, ours are stuffed with ground meat, carrots, potatoes – almost like a dry stew in a fat pepper. The pepper sits on a bed of mole, with some fresh salsa and salad on the side. A flan, decorated with swirls of chocolate and caramel completes our comeda. Comida costs us each 4.50 pesos – less than $4.00 Canadian. 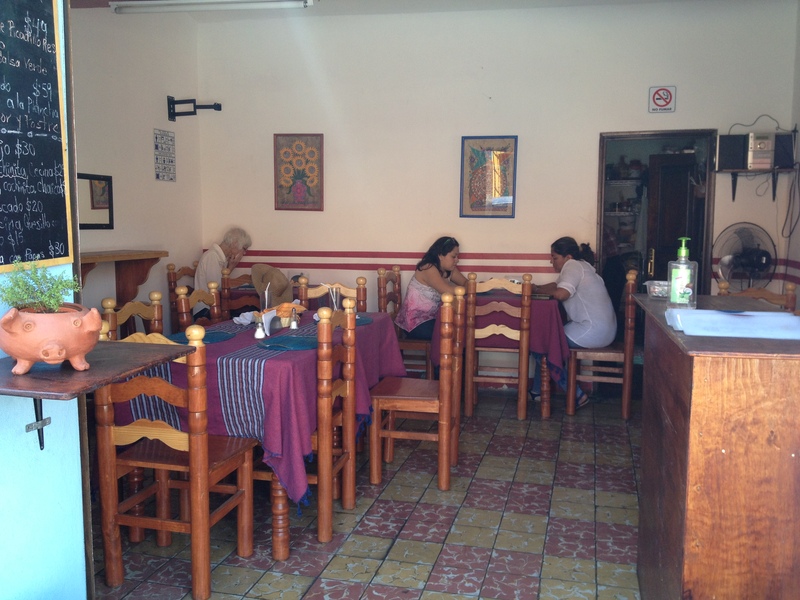 There are up-scale restaurants in Oaxaca and we could have gone somewhere fancy and paid twice as much, but this suited us perfectly. This is another reason why my mother lives in Mexico. The global financial crisis hit Mexico hard. It is incredibly cheap to live here. With every peso you spend, you feel you are doing a service for the country. As the heat of the day begins to overwhelm us, we spend the afternoon dozing, reading and recovering from comida. It hasn’t taken long to forget winter.